You could begin to see an improvement in your dog in as little as 1 week! 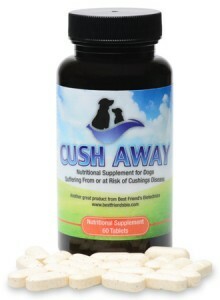 Cush Away is a unique patent pending nutritional supplement intended to assist the treatment of Cushing’s disease in dogs that combines three active ingredients; phosphatidylserine, melatonin and HMR lignans that research has shown reduces the production of corticosteroids or rapidly depletes them. Cush Away also contains two concentrated probiotics to aid in the digestion and absorption of the active ingredients and it is believed the active ingredients interfere with hormone signals that regulate the production of cortisone and cortisol thereby reducing the production of these corticosteroids. Each bottle contains 60 tablets, scored so they can easily be broken in half. Each tablet is 1 day’s dosage for a 30 lb dog. That’s only $22.50 a month! Cush Away is Manufactured from the Highest Quality All-Natural Active Ingredients and Presents Very Little Risk of Negative Side Effects. 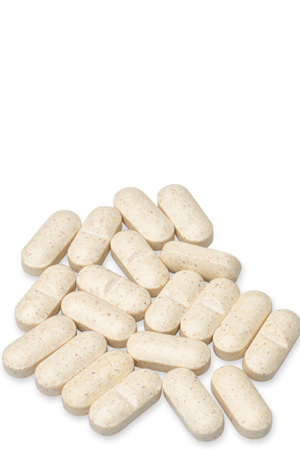 The Side Effects Caused by the Active Ingredients Are Primarily Beneficial, for Instance the Probiotics Can Increased Digestive Efficiency and Quality for Your Animal. Melatonin Has Been Shown to Have Calming and Positive Relaxing Effects on Canines and Can Result in Better Quality Sleep. Hmr Lignins Have Occasionally Been Shown to Cause Temporary Loosening of the Stool in Dogs but No Other Significant Negative Side Effects Have Been Reported. This Product Does Contain Soy. Cush Away Is a Nutritional Supplement Designed to Aid in the Treatment of Cushing’s Disease, It Is Not Intended to Diagnose, Cure or Prevent Any Disease or Illness. Only Your Veterinarian Can Diagnose Whether or Not Your Dog Has Cushing’s Disease and You Should Consult Your Veterinarian Before Starting Your Animal on This or Any Nutritional Supplement Product.